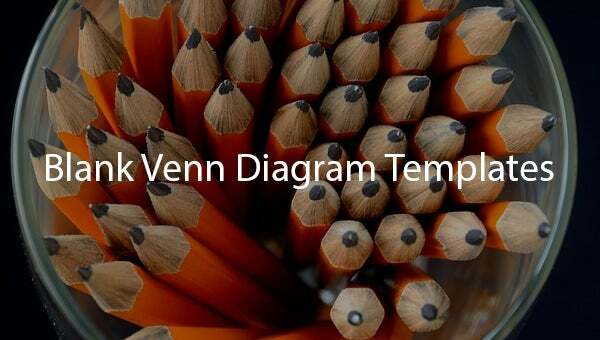 7+ Blank Venn Diagram Templates – Free Sample, Example Format Download! 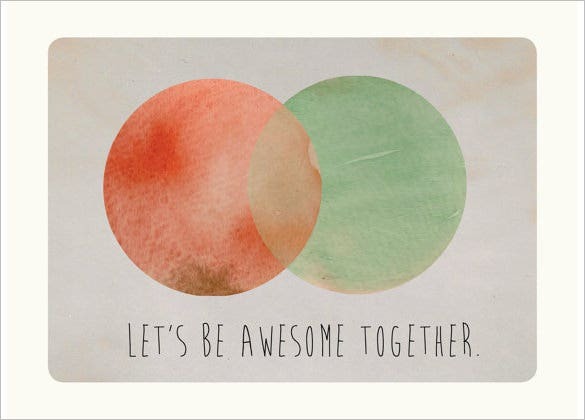 Venn diagrams are the best tool to understand logical relationships between two or more entities. 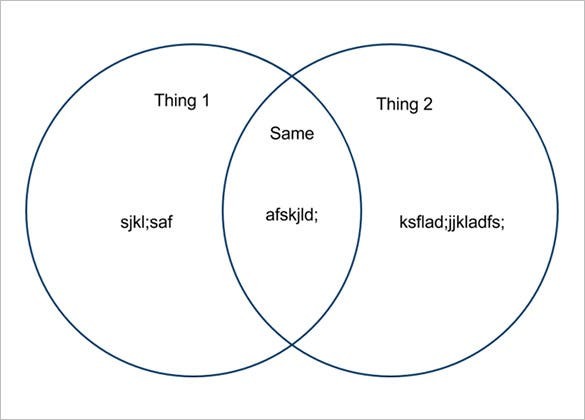 But instead of preparing such diagrams yourself, download our Blank Venn diagram templates. These templates enable you to add your own content and make modifications accordingly. Difficult concepts can be understood via elements of free Venn diagram for example union, intersection, subsets, mutually exclusive attributes, etc. This is a template for presenting two different items that have a relationship of some kind. It has two cycles overlapping horizontally giving an area for writing the relationship. The cycles have lines for easy writing. This is a template consisting of two cycles overlapping vertically with a section where the cycles share. It is suitable for showing a relationship among items. The cycles are blank allowing for flexibility. This template consists of three cycles overlapping slightly. This blank template is well suited to present a relationship among three aspects as need be. The overlap gives four sectors for showing the relationship fully or among only two cycles. This diagram has three overlapping cycles with different colors. 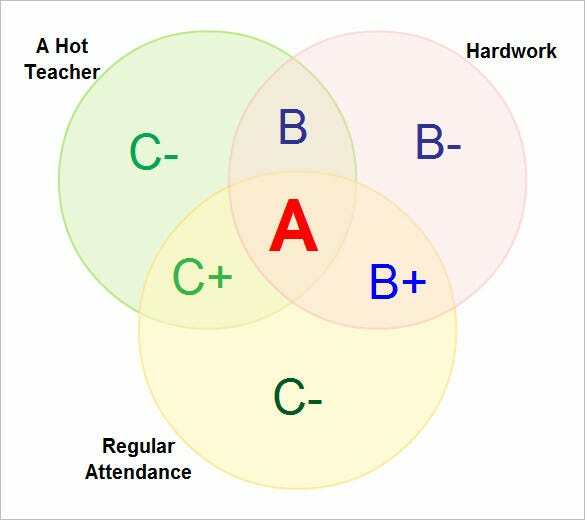 This gives seven different sections for placing the student performance grades starting from A, B+, B, B-, C+, C and C-. This downloadable template has two overlapping cycles. It has a heading for each of the three sections and content. Section one has item one, the right section has item two while the overlap shows similar items. This is a diagram with two overlapping blank cycles. Above the cycles is a line with spaces for writing the name, class and date. This template is suitable for class use. 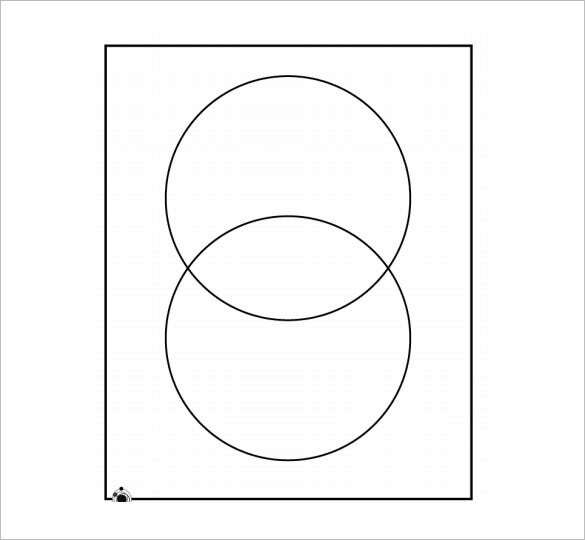 These are the best available samples of Venn diagrams. They can be used for a variety of purposes depending on the user’s requirements. 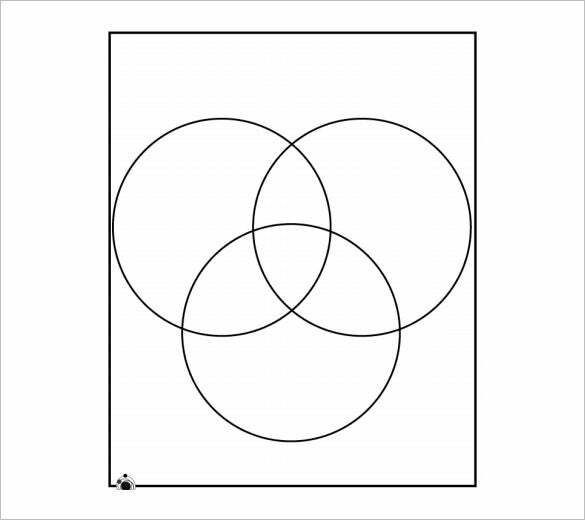 These venn diagram templates are high quality and easily printable. They are available across various formats for your convenience.